The Brexit vote has brought politics to the top of the mind for many investors. Ahead of the UK’s stunning Brexit vote, analysts wrote that a vote to leave could open “Pandora’s Box” in Europe, potentially prompting other countries to vote to leave the EU. 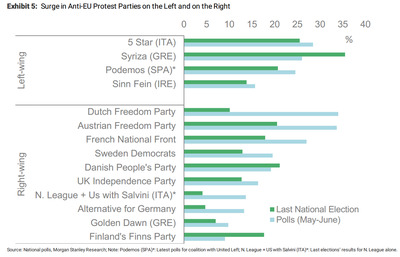 And in a recent report, Goldman Sachs noted that satisfaction with the EU has been steadily declining in Europe as political instability has surged not only in countries like Greece and Italy, but also Germany. In a note to clients published Monday, analysts at Morgan Stanley put in one clean paragraph why these political concerns are likely to linger around markets for some time. The summary, while not exactly groundbreaking, I think captures the broad consensus on what is dragging down the political mood in many Western economies: wages are down, debt is up, and the merits of free trade are being questioned. “To get some perspective, it is important to acknowledge that the political discontent runs deep at the moment. It is therefore unlikely to dissipate quickly, we think. The fundamental drivers behind the political discontent — notably a rise in international competition through globalisation,an increase in income and wealth inequality further aided by labour-saving technological change and a need to repair household balance sheets in the aftermath of the Great Financial Crisis (GFC) — are unlikely to reverse any time soon. In fact, a renewed spurt in skills-based technological progress as part of the next industrial revolution — notably through automation and digitalisation — or the organisational changes in labour relations due to the rise of the sharing economy are likely to reinforce the frustration felt by the lower middle class in many DM countries. With the availability of cheap credit and the ability to leverage household balance sheets no longer glossing over the deterioration in real income dynamics, a backlash against the free trade of goods and services and the free movement of capital and labour could be inevitable. And while Morgan Stanley’s commentary deals more closely with the EU, let’s not forget that Donald Trump, who has never held elected office and has campaigned largely on curbing immigration and choking off trade, is now the presumptive Republican nominee for president in the US. Unsettled politics are not just a European but broadly Western phenomenon now. 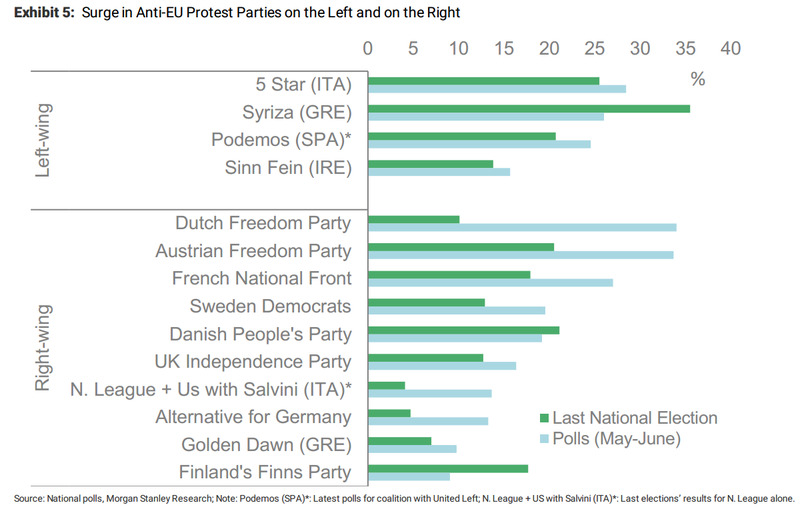 Last week, my colleague Elena Holodny highlighted a chart from Barclays that showed a majority of voters in both Italy and France want to hold a referendum on EU membership. Support for a similar referendum in Spain, Germany, Poland, Belgium, and Sweden is also north of 40%. In its note Monday, Morgan Stanley includes a chart capturing a similarly discontented mood across Europe, highlighted the rise of both far-left and far-right parties in major economies across the continent, a trend that seems unlikely to go away anytime soon.